Cook once and eat twice with these 3 must-know tips. According to the USDA food-safety experts, freezing at or below 0°F "keeps food safe indefinitely," but preserving the quality of your frozen food takes a little know-how. When freezing food, you are battling two forces: air, which dries food out, and moisture, which can make it icy and soggy. Here’s how to prep food for the freezer the right way. Let food cool completely before freezing. If you freeze it when it’s warm, it produces excess moisture; the moisture freezes and turns into ice. 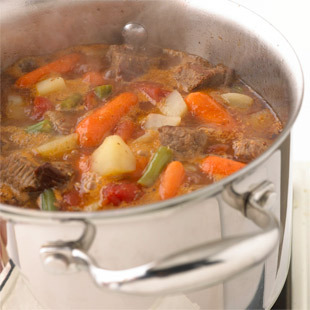 Plus, putting hot food into the freezer can also partially thaw other food around it. The best way to store food in the freezer is in vacuum-sealed bags or containers—removing all the air prevents moisture loss and keeps food from getting icy. The next best choice is to tightly wrap with heavy-duty foil or freezer paper. 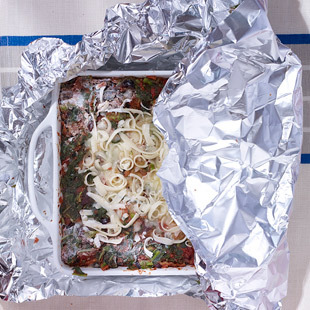 To double-protect casseroles, press a piece of freezer paper on the surface of the food before wrapping in foil or freezer paper. (Remove freezer paper before baking.) Individually wrap items like salmon cakes before storing in an airtight container or freezer bag. A freezer stocked with ready-to-go dinners does you no good if you don’t know what’s in there. 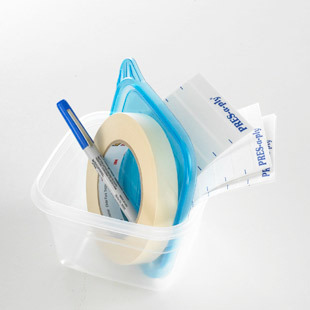 Label and date everything that you freeze. If you’re really organized, make an "eat-by" note on your calendar. Eat properly wrapped food within 3 to 6 months of freezing. Vacuum-sealed food will stay fresh for at least 1 year and sometimes up to 2 years.